June 1st...this day holds several bits of history for our family. First, 21 years ago today, my grandpa, Bailus VanBuren Dye, died. We had only known him for about 7 years at that time. 20 years ago today, the class of 1989 graduated from West Jordan High School. We had our commencement in the gym at the school. Now they do graduations in big event center places, like the Ecenter, the Huntsman Center or the Marriott Center. Having recently attended a couple of these services, I told my mom that I was glad we had ours in the gym at the high school. I was one of the nerdy ones that actually purchased a videotape of the commencement. I think we may have tried watching it right after we got it, but I don't think I've watched it since then. I pulled it out and watched it this afternoon. It was not the best quality video (audio) I've seen on a video, but it was 20 years ago. I was pretty impressed that it was all over in about 90 minutes. They did the presenting of the class, individually, after they showed the closing prayer. So when it cut off abruptly after the reading of the names, it caught me off guard, until a moment later when I remembered that they had already shown the prayer. Michelle Plouzek: We are individuals solely responsible for our actions. Take the road less traveled. Wendy Griffin: We truly have the best mascot in the state, the Jaguar. 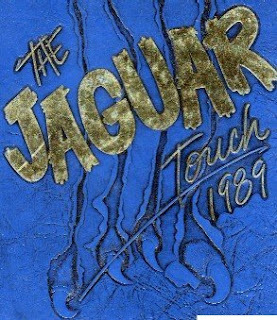 (She pulls out a stuffed animal) The Jaguar is the largest most powerful wildcat in the world. Jaguars stand for strength and power. The sky is the limit for us now. We are the ones that others will follow to meet their needs. MaryAnn Mabey: (with great enthusiasm) High school became exactly what we decided to make it. Graduation is by no means the end of our opportunities. Recognize opportunities and use them for our best interest. Dax Kiger: He could hardly keep a straight face as the students recognized noisily every time he proudly mentioned the school. (Was this the bouncy balls or was it some other clap/stomp thing? He was by far the funniest speaker.) He closed by commenting that we are the leaders of tomorrow. Jerry McCleary: (addressing the parents, mostly) This class has probably been the best one we’ve ever had. They will accomplish things that you and I have not been able to accomplish in our lifetimes. They are truly unique. They are the last class that attended WJHS for a full four years. God Bless you. Dr. Tom Owen, Area superintendent: reiterated the motto above. He also quoted Denis Waitley by saying, “Losers make promises…winners make commitments.” I hope you are committed to be the leaders of tomorrow. 14 years ago today, my sister was part of the class of 1995 at West Jordan High School. They, too, had their commencement in the gym at the school. I remember going to her graduation and it feeling like a reunion of sorts from our class as many of us had siblings that were graduating that night. This year we celebrate our 20-year class reunion and I am sure I will blog about that late in the summer. In preparation for this, if you would email your contact info and the info of anyone else from our class that you may have access to, we can update our file, thanks! I have many other memories about that night 20 years ago and I will share them another time, maybe next year, maybe 5 years, time will tell. But, for today, what are your memories of that night?